A little over two weeks ago I started a post on ranking an old publication. See that post first for a primer for this one. To recap, the purpose of this is to take an existing post that I published well over a year ago and get it ranking better. I chose a post that targets a good keyword that was published over a year ago but was not ever promoted. 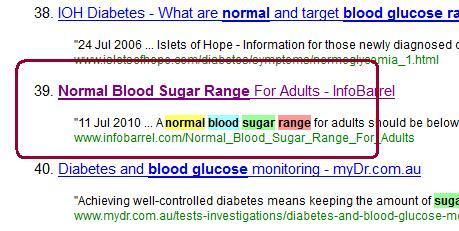 At the end of August my IB post on “blood sugar ranges for adults” was not ranked in the top 100 for its main keyword. Two days later after 8 BMR links it was ranked #96 and two weeks after that, this morning it is ranked number #39. Not bad for whipping up 10 posts to BMR in three days and spending 20 minutes to add 10 internal backlinks to the post from other articles I previously published on the IB domain. No it hasn’t. Not yet at least. So far my efforts on this old article have increased its ranking to #40 but it still hasn’t gotten any search traffic. Going through my Analytics it has received 3 visitors from search in all of 2011 and none so far in September of 2011. It looks like I need it to be ranking better to start getting the eyeballs. I could very easily pump out 10 more BMR links to this post over the next couple days and see what that does but I’d like to take the opportunity to build some authority to some other old pages in my IB portfolio which can indirectly improve the ranking and authority of this main article on the IB platform. For this step I’m going to select one other article on IB which I added a link to two weeks ago and throw some short posts up linking to it. Of the 10 articles I previously chose I’m choosing one that targets the keyword: “lower blood glucose levels” which is roughly 18 months old. To my knowledge it has approximately 2 links pointing at it that I built ages ago and it too gets no search engine traffic. 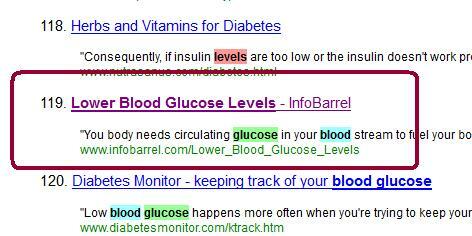 To date my article on “lower blood glucose levels” has received 6 entrances via 5 keywords in all of 2011. It is currently ranked #119 for its main keyword and now that it links directly to my article on “normal blood sugar ranges” I want it to have more authority and to start getting some eyeballs on it. This afternoon I plan on publishing 5 BMR posts (150-200 words each) linking to my article on “lowering blood glucose” and then publishing 5 more tomorrow giving me 10 links to that post. This should help get the ball rolling. I will also write up five 300 word posts to be published on PostRunner with the goal of sending five links to each of the two backlinks I built to this post last year. I have their URLs saved in a tracking spreadsheet I made a year ago so this should be easy enough to do. Basically this will accomplish a couple things. I will boost the authority of existing backlinks to my IB article while building 10 new backlinks to the same article via BMR. I will also hit the on-site SEO factor by adding a handful of links to the article from other articles I’ve published on the IB platform much like I did two weeks ago for the primary IB post. Is This Really Worth The Effort? First of all writing this blog post is more effort than actually doing the work. I enjoy it though and want to get blogging again. Second, yes, it should be worth it but you never know. By boosting the authority of two offsite backlinks on other blogs and adding 10 more backlinks, my post on “lowering blood glucose levels” should be a more authoritative page in theory. This ‘more authoritative page’ will then be more meaningful in regards to the internal link it gives to my main IB page on the “normal blood sugar range for adults”, which could help that post rank better for its main keyword. It is currently ranked #39 (as shown above) and I still want it to rank higher so that it starts getting some traffic. Two weeks ago it took me a total of 50 minutes to make and post BMR links and 20 min to build internal links to the first post. This week it should take me 50 min to build and post 5 PostRunner posts, 50 min to build and post 10 BMR posts, and 20 min to build some internal links. Combined that is 190 min in three weeks – a little over 1 hour a week. Let’s see if it’s worth it. I will revisit this in the near future so follow along. Read these posts for more information on what PostRunner is and what BMR is. I am a new member of TKA and am in the process of building links to my articles and my site through the postrunner system. I am finding that the links that I am getting are helping the sites articles climb in the rankings a bit. I am also wondering if the time spent building links will payoff in the future. I am running sick submitter to many of my websites. I ran sick on my one of blogspot. It came from 352 to 12 position in one day. It is jumping but i am sure in next 30 days it will rank higher. Now i am also concentrating on blogspot. I want additional $100-200 from blogspots. @JC - having been a tka member for around 18 months I can say that it will be worth it if you keep at it for a while... you'll also find that by backlinkimg ib articles (or other articles for that matter) which in turn backlink your site you'll see remarkable improvement overall. Goodluck with IB and with TKA. @Rahul - good luck, ive never used ss but I'm sure it can help in it's own way. That's quite a jump. I'm sure you know this but blogspot blogs come with there own risks. Make sure you experiment with other platforms too. Nice to hear that the ideas are floating around in your head. I've actually started heavily promoting some of my older IB work on BMR. Seeing good results too. I hope you are seeing good results. BTW I'm back posting on IB again this month. See you there, in the forums, and the comments here too. :) Thanks for letting me know what's going on.